At the corner of Nevsky Prospect and the Moika Embankment stands the Stroganov Palace. This palace is a fine monument of the Elizabethan Baroque. This palace on the Nevsky Prospect is similar to the Winter Palace by its architecture. It is an outstanding work by the architect Bartolomeo Rastrelli. 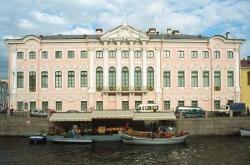 This palace was erected a little bit earlier than the Winter Palace between 1753 and 1754. The palace belonged to the counts Stroganov. One of them — Alexander Stroganov — was the President of the Academy of Fine Arts at the end of the 18th cen­tury. The first palace owner was the Count Sergey Stro­ganov. The palace was gradually turned by its owners into a repository of various art collections, including those devoted to Western European and Russian painting. Be­tween 1788 and 1793 the interiors of the palace were redesigned in the classical style by Fyodor Demertsov and Andrey Voronikhin. Moulded decoration covers most of the central part of the building. The arch over the gateway is embel­lished with double columns supporting an elaborate pediment. The Stroganovs’ coat of arms is depicted on the pediment. There are two sables on the coat of arms. They stand on hind legs and hold a shield in their forepaws. The shield is divided into two parts. The fur is depicted on the lower part and the head of a bear is depicted on the upper part. Above the shield there is a helmet and another bear’s head. This coat of arms may be deciphered as follows: the bear is the master of the taiga and sable has the most precious fur. The depiction of them on the Stroganovs’ coat of arms says of the unlimited power of the Stroga­novs in Siberia. They owned vast lands and the count­less riches of Siberia. The palace was the property of the Stroganov family until 1917. After the revolution, it was open for visitors as a historical museum of daily life, but later its collections were disintegrated. In 1988, the building became a branch of the State Russian Museum. The palace houses an exhibition of decorative and applied art.